My son LOVES going to the zoo. Me, not so much. We live in Nebraska near the Omaha Henry Doorly Zoo. It is an awesome zoo, but I am not an animal person. 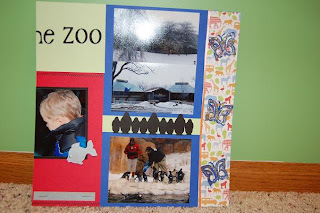 We have a zoo pass and we go to the zoo every spring and summer. Now that Tanner is 4 nothing gets by him! He knows the onramp to the Kennedy Freeway will take us to the zoo, so every time we pass the onramp he shouts - "The zoo is that way...can we go?" He can also see the Desert Dome from the interstate and announces that he really, really wants to go to the zoo right now - even at night when the zoo is closed!! This Saturday morning (the 16th), I got a wild hair (also thinking it was going to be in the upper 30s or low 40s) and thought Tanner and I could go to the zoo since Dad and Tyler were at bowling all day. Well, we went to the zoo but it was no where near upper 30s!!! It was soooo cold but Tanner was happy as a lark. We went inside all of the buildings and we saved his favorite for last - the Desert Dome. I was secretly hoping he would get tired (yeah right) or would forget (never)!! I do not like the basement of the Desert Dome (Creatures of the Night) because it is dark and there are alligators down there. I have nightmares of falling off the bridge and getting eaten by the gators. Tanner told me "I'll keep you safe mommy!" Now how could I refuse that? 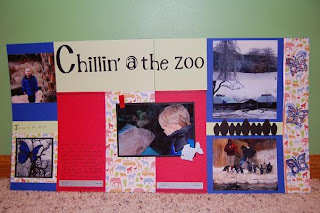 I chose these photos from our freezing cold zoo trip for my LID layout challenge. I finished it late last night/early this morning - just at the deadline!! I followed the SOUS (Stuck On U Sketches) sketch from Friday for this layout. 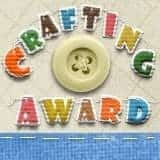 It also meets the requirements for the Practical Scrappers challenge of using patterned paper. Again, I found the sketch challenging for me as I need to "boy it down", but I am enjoying challenging myself and stepping out of my box!! It is hard to see, but I wrote my journal around the circle. We have so many great memories from our annual Ozarks vacation! I completed this sketch from Practical Scrappers. This is my niece at her Horse birthday party. We all go to ride her new horse Dakota! 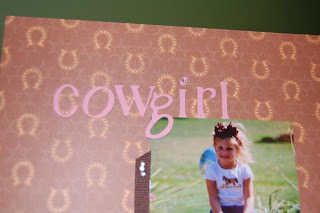 I used paper from DCWV, ribbon, rhinestones and A Child's Year Cricut cartridge for the title. I had fun creating this LO! I really like the pink and brown. This was a Valentine Sketch posted on the Sketches4you site. 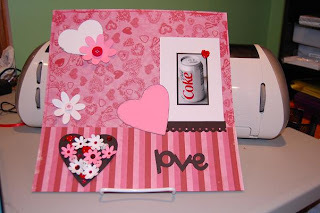 I did not have the photo that I wanted, so I substituted my 4th love (just after my hubby and 3 boys) - diet coke!! I did not journal yet, as I am not fully commited to keeping the photo. Being a mother of all boys, I do not keep a big stash of flowers and the ones I have did not really go with this paper, so I used my cricut to cut some out. I got the heart-shaped buttons at Michaels. 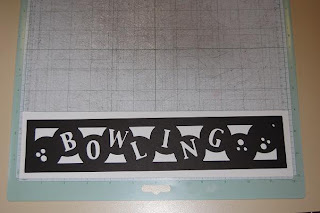 I made these bowling layouts and border with my Gypsy. I took rectangles from George & Basic Shapes and welded them together for the frames. I used circles for the bowling balls. I used Base Camp for the letters. I found my bowler on Going Places (really a runner). I also used Paper Doll Dress Up for the bowling pins - they are juggling pins from the clown. Yikes - you can see how worn in (and dirty) my mat is!! I put the border on the mat so you can see the measurements. 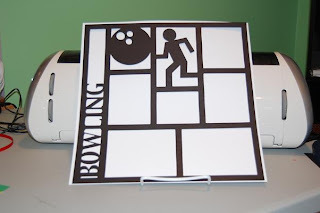 I went online to look for bowling scrapbook paper and found something similar to these LOs - I figured I would give it a try!! I saw a greeting card in the Current catalog that inspired me to create this card on my Gypsy. I really didn't need to use the G except it was easy to measure the pieces to make sure they would fit properly on the completed card. 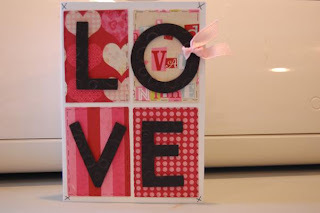 I embossed the letters L O V E with my cuttlebug. I did not have black thread to stitch on the card, so I improvised with my black marker. I used K & Co. paper from the "Lovely" paper pad. I made this flower notebook with my Gypsy. I used Gypsy Wandering for this project. I welded the flower shadow into the cover. 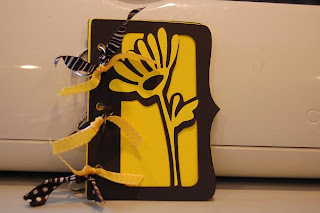 I cut out the flower in yellow and adhered it to the cover. 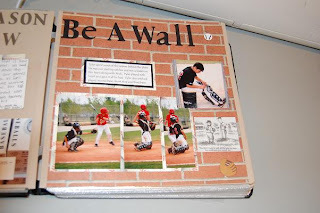 Tyler is a catcher and hears "Be a wall" quite often. I found this brick paper and couldn't resist - he he! I also added a photo copy of a cartoon I found in the newspaper that sums up how much our teens communicate via text messages. It says: "You didn't have to walk all the way out here. You could have just texted me." I used Base Camp cartridge for the title. This layout was so fun to put together. On the fence usually has a different meaning, but this tournament was a nail bighter at times. We also had to climb the fence to retrieve foul balls. I welded the letters for the title with my Gypsy using Base Camp cart. and I welded the fence from the My Community cartridge. All the stress was worth it - our boys took 1st place at nationals!! 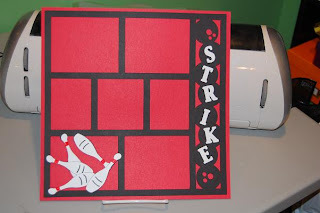 I was inspired by the LID (Laying It Down) challenge from the Cricut message board. I used photos from our Disney trip in September 2009. The mickey heads & Disney came from Mickey & Friends cartridge. The 2009 came from Lyrical Letters and () came from Plantin Schoolbook. I wanted to keep the colors to mainly black, red & white since the photos are very busy. I sewed a border next to the grid - too much "white space" for me!! This is my take on the sketch: I used Making the Grade cart. for the title and Going Places for the tag. The sketch was more frilly than I needed, so I embellished with staples. I made it into a 2 page layout. I welded "game night" from the Designer Calendar cartridge to make a square border. 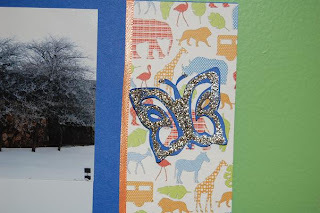 This was my first attempt at making a page border. The corners are a little blurry because I have not stuck it down yet - I want to wait for the photos before I commit to a color!! This page is the second layout challenge for Sketches4u. I chose this photo of my 3 boys. My oldest was home from college for Easter and I wanted some photos of all three boys so I could make some Mother's Day gifts with them. They are such good sports!!! The letters and numbers are from A Child's Year and the stars are from George. I used my gypsy to weld the ladybug into a card. The ladybug is from Walk In My Garden. My son is on the bowling team this year. 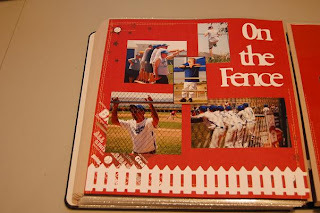 I made these word books to donate to our tournament raffle. The pics are not in the correct order - sorry! I used my Gypsy to design the books and cut them out on my Cricut. I used George for the shapes and Gypsy Font for all the letters except the small word BOWL is from Base Camp. I got a Zutter Bind-It-All (finally) and made this note pad. 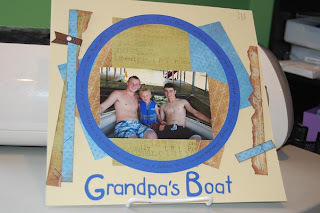 I got the idea from the Cricut Blog from Candace http://www.scrapadoodledee.blogspot.com/. I used 3x5 note cards for the paper and made the cover out of chipboard just a pinch larger than 3x5. I had so much fun making this project! Here is my back yard today after our third snowstorm in one month!! Notice one of the swings is under the drift. 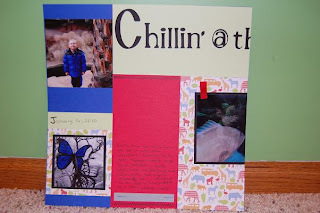 I completed my first scrapbooking challenge ever!! I was inspired by www.sketches4u.blogspot.com Here is the page I made. You can visit the blog for the sketch that I worked off of. This is not my usual style - ok those of you who know me know how well I follow instructions!! It was good to follow instructions for a change! Sledding to go along with more snow! We have had so much snow this year already I thought this sledding page would come in handy! It could easily be stretched into a 2-page design. The sled is from Stretch Your Imigination, the snowflakes are from Christmas Cheer and the letters are from San Serif - all Cricut carts. Here is a January calendar page I did using the Designer's Calendar Cartridge. Here is a photo of a 4 inch tile that I made into a keepsake. I copied a 3.5" x 3.5" photo onto a piece of white tissue paper. I taped the tissue paper to a piece of cardstock and fed it into my copier. 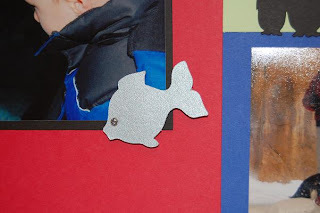 I brushed a thin layer of mod podge on the tile and put down the photo. I carefully brushed a thin coat on top of the photo. I added two more coats, letting them completely dry in between. I sealed it with a spray sealer and then put sticky back cork on the back. I made these for my daycare parents this year for Christmas. 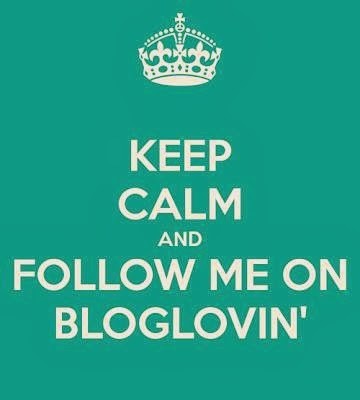 This blog is one of my New Year Resolutions! 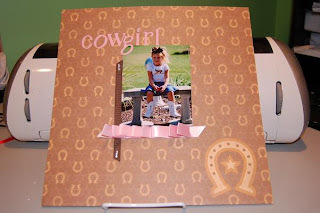 I am a life long crafter and have been scrapbooking for 12 years. My current favorite tool is by far the Gypsy! 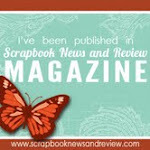 I am anxious to post photos of my current projects and scrapbook nook!